Approximately 20 percent of worldwide Internet users between the ages of 16 and 64 have accounts on Instagram, up from 15 percent in the middle of 2013, according to data from GlobalWebIndex. Instagram users are 50 percent more likely to be located in North America. Teens are 50 percent more likely to be active Instagram users. Instagram users are 25 percent more likely than average Internet users to be in the top income quartile. 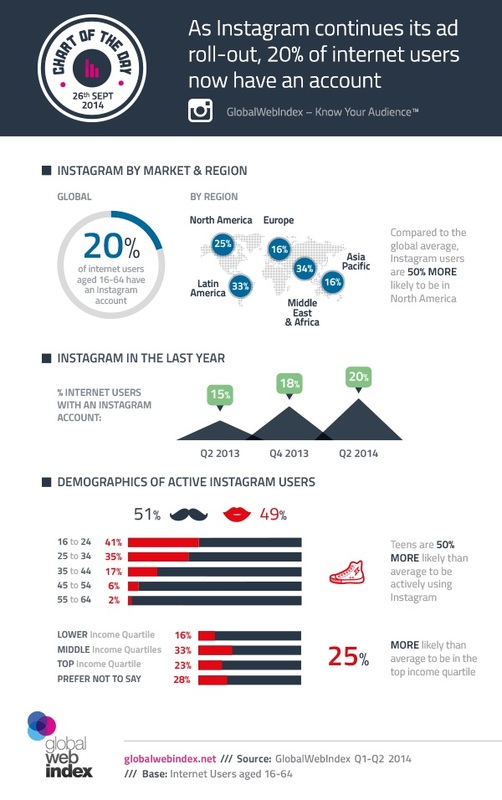 As our data shows, the Instagram audience is a highly attractive one for advertisers. Not only are the bulk of its users drawn from the youngest age brackets (with 41 percent in the key 16-to-24 demographic), but compared to the global average, they’re also significantly more likely to be in the top income quartile. Worldwide, some 20 percent of internet users aged 16 to 64 now have an account on the service, a figure that has shown consistent growth over the last year (having risen from 15 percent in mid-2013). But this headline figure can rise even higher in certain regions, peaking at around one-third in Latin America and the Middle East.